With the Giro just over and the Tour about to start, I imagine it’s a time when many start dreaming about booking a 2013 or 2014 cycling vacation to the Alps. Here’s an idea on how to make a trip better. Many big and famous passes in the Alps hold days where they close the road to motor traffic. This can vastly improve one’s enjoyment on the bike, especially on a weekend on a famous climb. And especially to avoid hordes of touring motorcycles in August. At all these events you will find riders of all levels, drink/ food stands, and an unbelievably high level of cheerfulness. These are not cyclosportives/races. No obligatory start times. 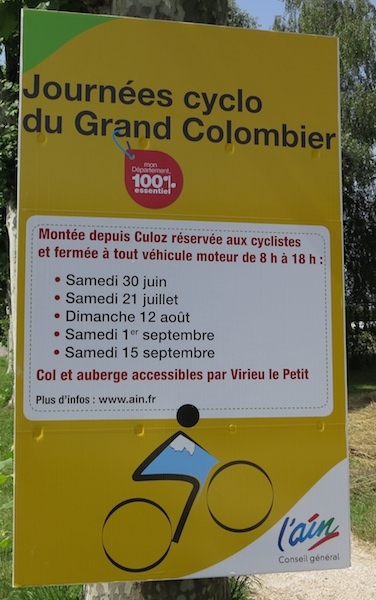 Below is a short list of closed climbs in 2012 – darn good list of climbs too. If you know any other events, please add them in the comments. 29/07 : Col de Joux-Plane (bad for debutants, haha). A 55 km high-altitude loop plus roads leading up to it all closed. Loop crosses four of the most beautiful Italian Passos: (Gardena, Pordoi, Sella, and Campolongo) as it circles the Sella. Truly awesome. All three sides – including the Swiss side! Stelvio – enough said. The Jura giant will make its Tour de France debut in 2012. From the Culoz side there will be several car-free days – not that this great climb ever has much traffic. A beautiful climb in eastern Switzerland – details. 2013 Events for the Mont Blanc-Savoie Region can be found here – looks fabulous.